*Substitute 2/3 cup granulated sugar and 1 tablespoon ground cinnamon for the Baker's Cinnamon Filling and water, if desired. If you use sugar and cinnamon, DO NOT ADD THE WATER. 1) The flour/liquid ratio is important in this recipe. If you measure flour by sprinkling it into your measuring cup, then gently sweeping off the excess, use 7 3/4 cups. If you measure flour by dipping your cup into the canister, then sweeping off the excess, use 6 3/4 cups. Most accurate of all, and guaranteed to give you the best results, if you measure flour by weight, use 33 ounces. 2) To make the dough: Combine all of the dough ingredients, in the order written, in a very large bowl (at least 6 quarts). Stir to make a sticky dough. You can do this in a stand mixer and then transfer to a larger bowl; or simply use a big bowl and spoon (or dough whisk). 3) Cover the bowl, and let the dough rise for 2 hours at cool room temperature. 4) Refrigerate the dough for at least several hours, to chill it and make it easier to work with. It can be refrigerated for up to 3 days before using. 5) When you're ready to make sticky buns, make the filling. Combine the Baker's Cinnamon Filling and water, stirring till smooth. Set aside. 6) To make the topping: Spread the melted butter and syrup (or honey) in a lightly greased 9" round cake pan. Sprinkle the sugar(s) atop the butter, then scatter the nuts atop the sugar(s). Set aside. 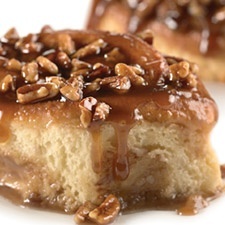 7) To make sticky buns: Spray your hand with non-stick vegetable oil spray, and dip it into the dough in the bucket. Pinch off/pull out 1/3 of the dough; this is about the size of a large softball or a large grapefruit, a scant 22 ounces. For best accuracy, weigh on a scale. Place the remaining dough back in the refrigerator, to use another time. Or wrap and store in the freezer. This dough recipe is enough to make three 8" or 9" round pans of sticky buns. 8) Transfer the dough to a floured work surface, and rol1 it into a rectangle approximately 15" x 10". 9) Spread the filling over the dough, leaving a narrow margin around the edges uncovered. 10) Starting with a long edge, gently roll the dough into a log. Don't roll it too tightly; if you do, the centers of the buns will pop up as they bake. 11) Cut the log into 8 pieces. 12) Space the buns in the pan. Lightly press each down till they're touching one another. 13) Cover the pan, and allow the buns to rise till they're quite puffy, about 1 hour. Towards the end of the rising time, preheat the oven to 350°F. 14) Uncover the pan, and bake the buns for 40 to 45 minutes, till they're a deep golden brown. 15) Remove the pan from the oven, and turn it over onto a piece of parchment, or onto a cooling rack set over a piece of parchment or waxed paper (to catch any drips). 16) Lift off the pan, and scrape any nuts or sugar in the pan onto the buns. 17) Serve immediately, or let the buns cool a bit. Wrap any leftovers securely, and store at room temperature.